"... one musician, but ten talented fingers!". - Sir Ian McKellen (UK). Montreal resident Liu Fang has achieved an international reputation for her virtuoso and deeply spirited pipa playing, and is regarded by many as the most eminent pipa soloist in the world. For the uninitiated, the pipa is a four string lute and one of the oldest Chinese music instruments. Whether performing Chinese classical or folk tunes or a modern Western composition, Liu Fang is renowned for possessing a uniquely masterful technique and a special grace and empathy for the music she plays. Born in Kunming, China in 1974, Liu Fang began playing the pipa at the age of six, and soon after became recognized as a child prodigy. She received a number of prizes in her early years, graduating from the prestigious Shanghai Conservatory where she also studied the guzheng (zither) in 1993. 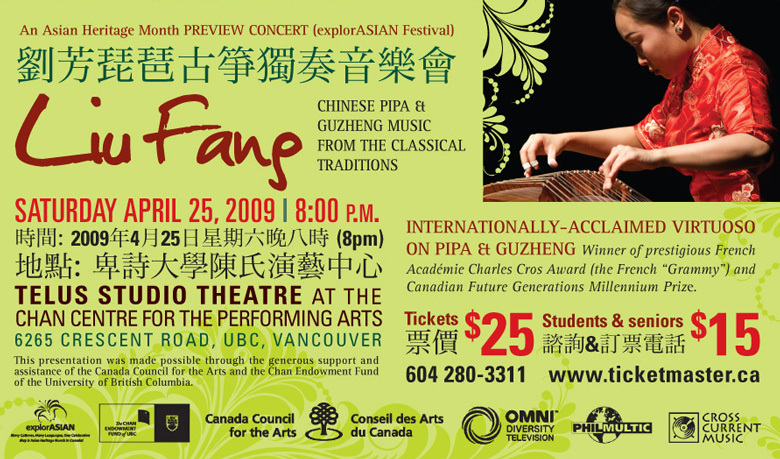 Liu Fang moved to Montreal in 1996 and embarked on an impressive international career, performing at concerts and festivals around the world. From the Theatre de la Ville in Paris to the WOMAD Festivals in the UK and Spain to BBC concerts in London, she has built a remarkable artistic profile by capturing audiences and critics with her expressive style and expertise as well as her eclectic and wide-ranging repertoire. She has produced 9 solo and collaborative CDs, and was awarded the Millennium Prize for Future Generations by the Canada Council and the respected French Academie Charles Cros Award (the French "Grammy") in 2006. Liu Fang continues to perform in solo concert around the world, as well as with symphony orchestras, string quartets and ensembles and has collaborated with musicians from different cultural backgrounds. She has been featured in numerous national and international TV and radio performances. Celebrated in the press as being a "divine mediator" (World, 2006), "the empress of pipa" (L'actualite) is able to transmit in an erudite and powerful way the beauty and richness of China's ancient music and the subtle yet profound nuances inherent in the instruments she plays. A very special night of music is on offer in the lovely ambiance of the Telus Studio Theater of the Chan Center for Performing Arts on Saturday, April 25, as a preview event to Asian Heritage Month (ExplorASIAN Festival). of the Canada Council for the Arts and Chan Endowment Fund of the University of British Columbia. Special thanks are also due to TV station OMNI BC in Vancouver.